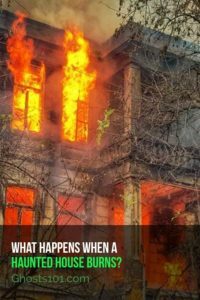 Do ghosts linger after a haunted house fire? Maybe. I’m fairly certain the ghosts remain, whether a house is there or not. 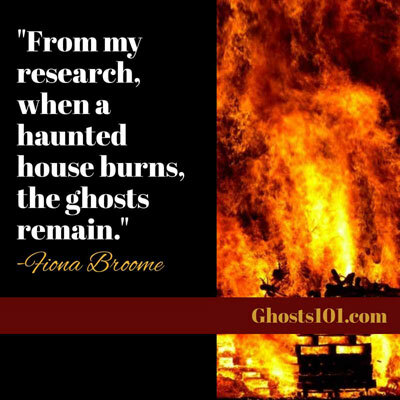 So, the short answer is: From my research, when a haunted house burns, the ghosts remain. Many ghosts seem to be tied to the location rather than the structure on it. For example, while “green lady” ghosts may actively protect their homes, they may be unique in that kind of attachment. According to one story about Henniker, NH (USA), the ghost of “Ocean Born Mary” helped the fire brigade at her haunted house’s fire. I’m not sure whether she would have remained at the site, if the house was destroyed. In 2018, the Netflix series, The Haunting of Hill House, suggested that the house should not be burned. It was suggested that, as long as the house remained, the ghosts could live there, happily. I saw a logic gap there. In the series (spoiler ahead), people (alive or dead) in the “ghost reality” seemed to see Hill House in its former glory. But, in real life, the abandoned house was overgrown with vines, and moldy. So, why wouldn’t the ghosts still see “their” house, as it originally was, even if all that was left was ashes? A good example of a haunted site – and a related fire – started in November 1942. That’s when the Cocoanut Grove nightclub in Boston (MA, USA) burned to the ground. That was a tragedy with enormous impact, and it changed building codes across America. Today, the site of the fire – at what used to be 17 Piedmont Street – is mostly a private parking lot in Bay Village, a residential neighborhood. 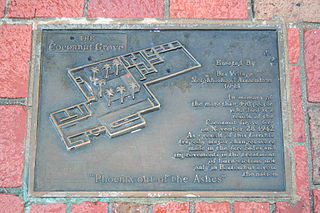 Plaque at the Cocoanut Grove fire site, Boston, Massachusetts (USA). The parking lot is protected by a strong fence. As far as ten feet from it, ghost hunters still record baffling EMF spikes, eerie EVP, and “hot spots” (thermal). Also, we see interesting, light-related anomalies, even during the day. I’m not sure the site was haunted before the fire. Since then, it’s one of the most unusual, highly active sites I’ve visited. So, though the original building is gone, it’s definitely haunted… intensely haunted. The house or the land…? Now and then, a client asks me about her newly-built (but haunted) house. In general, I don’t believe any ghost is injured when the home it’s attached to is destroyed. I’m not sure that it’s “set free” by the fire (or bulldozing, or whatever), either. In some cases, it appears that the ghost remains at the location. The ghost seems to wait until a new house is built on the same site. Then it may stay, or decide to move on. I’m not sure what to think of the Amityville Horror House. The evidence is conflicted, at best. However, it seems as if something odd had lingered there, and affected Ron DeFeo. I don’t believe the Amityville haunting will be over until all of the evidence is found, investigated or debunked, and the true stories told. I can think of one case where a ghost (or ghosts) remained attached to the physical structure rather than its former location. Path to the Tyng Mansion site. That’s the Tyng Mansion in Tyngsboro, Massachusetts (USA). The house was haunted long before it was destroyed by a devastating fire. What remained at the site — mostly charred building materials — was bulldozed. They pushed the rubble into a slightly marshy field next to the home’s foundation. The remaining foundation of the house seems normal and generally inactive. Instead, I’ve seen EMF spikes around the overgrown, somewhat marshy, rubble-strewn land next to it. That’s where you’ll see evidence of decaying outbuildings. Other than that, I’ve never investigated a site where the ghost (or ghosts) clung to the actual building instead of the land it had been on. I think it’s funny that there are actual ghost hunters that get paid to do what they love. My husband always talks about being a ghost hunter, and working for haunted houses. I can’t help but always laugh at him. I think it’d be fun though to visit a real haunted house, we’ve been wanting to since Halloween ended last year. The real thing is always SO much more intense than seasonal “haunted houses,” I’m just as amazed that anyone goes to the latter… except for fun, I suppose. Visiting a real haunted house can be worth traveling to (assuming you’re in Las Vegas, that is). Los Angeles is a bit of a drive, but it has some superb, truly haunted houses. i once lived in a old red house only when i grew up and moved away i found out it use to be a church back then and when i was littile in that house i had cold goosebumps and hear my name get called i ask if my mom called me or dad or my sister i am the youngest of my other 2 sister and no one called my name i had image of a girl crying before i had tx turn to news everyday seince my grandpa died in that house my grandma i never saw died in that house before i was born i thought maybe she was the one watching over me my middle sister told me she feelt something heavy lay beside her and smell of perfume but a fire happened there and know it no longer stands it became vacant my family still owns it will there spirits still be there if so how do i get them to go to the light to heaven where they belong im know 24 and haven’t been back there but i really like stop back and help them if there still there to move on. I just had a house fire and am deciding to bulldoze all or leave the oldest part, an 1850 antique colonial, and rebuild with new additions. The spirits in my home were lovely and protective, and I am hoping they will still be present. Anyone have any thoughts on this? I’m so sorry to hear about the fire. I’m sure you were very sad. If it’s possible to salvage the oldest part of the home, for history if not for the spirits, I think that’s a good idea. Your local historical society may have some advice or even some helpful resources. In general, it seems as if spirits prefer to linger at “their” homes — things that seem familiar to them. But even when a building is torn down or bulldozed, many ghosts remain. I think that’s especially true of those who’ve made themselves known to the residents, and those who have a protective nature. I hope things go very well for you and your ghosts. It sounds as if you have a wonderful relationship with them, and I’m sure they appreciate your thoughtfulness. I can say from experience what I believe happens. The spirits stay in the same spot. I lived in a citrus plantation home called Windsong- built in 1881. For the year I lived there- I had several encounters with spirits. The home was demolished, to make way for a subdivison. 20 years later I went back to walk the property to see if I could get some EVPs, and I did. The voices were active during the day- just like when the home was there. I have visited & investigated several locations known for hauntings. Yes almost always the spirits remain at the location they originated from. However I do have items with attachments but that’s another story. Previous Previous post: Is the ocean haunted? Next Next post: What’s the difference between a haunted object and a haunted house?